I just bought my first published eBook. 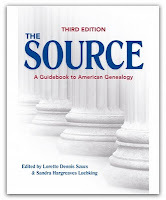 It was Online State Resources for Genealogy compiled by Michael Hait. I have long been interested in eBooks. About a decade ago I made a small investment in stock in FatBrain. I believe it was Barnes & Noble that acquired FatBrain. That might be a genealogy worth documenting someday. This post is not a review of Hait's book. It was only published yesterday and I just discovered it about an hour ago. However, it seems to be an ideal candidate for the digital format. Hait uses a vehicle I use in my genealogy research classes. I give students a handout of links. At the same time the students are encouraged to login to my website and follow along at their computer workstations. That way they only have the initial URL for that lesson to type in. The individual sites can be accessed by clickable links--a great time saver of valuable class time. In a similar manner Hait provides links to the resources listed in his book. He invites readers to notify him of broken links and links he should have included. This will be a great way to keep the book up-to-date. It has been said that Cyndi Howells' biggest challenge today is fixing broken links on her massive resource Cyndi's List. it seems to me that digital publishing is gaining critical mass at an accelerating pace. 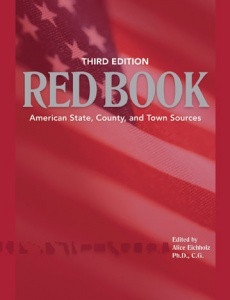 Two venerable genealogical reference books that have long been staples of any genealogy library reference collection are The Source and the Red Book. When I visited Ancestry.com headquarters last April, I notice that each employee had a copy of these two books right next to their computer monitor. It was about at that time that Ancestry announced that these resources would only be made available digitally from then on. Most of us are aware of the number of genealogical periodicals that are converting to digital only distribution or ceasing publication altogether. Like all evolution, some "progress" is easy to embrace. Other "progress" is more painful. A variously attributed and slightly altered phrase comes to mind. It is better to light a candle than to curse the darkness. With that admonishment in mind, it would appear we are witnessing a significant change in the way genealogical information is published and we need to make sure we take advantage of the opportunities it provides.